Assistance by the purchase of car / vehicle / truck / TIR / trailer / agricultural machinery from abroad (Germany, Italy, England, Bulgaria and other countries). How to buy a car / vehicle from Germany step by step. Assistance for the purchase of car / vehicle from Germany. Tips for buying a car. I can help you with closing the deal and checking the car in Germany locally and with playing for you on the German and European Auctions like autobid.de and auto1.com . In short, I can make your life easier. Do not hesitate to contact me via Email on georgi.nikolov@cars-help.com or via Phone,WhatsApp on +359 888 981 781. Every car purchase can be quite labour-consuming and unpleasant occupation. Especially given that most of the used cars are imported from Italy and, as we all know, they are in poor technical and visual condition. Very often the imported cars have been hit and afterwards being fixed in a Bulgarian service, bumpers and hoods are quickly repaired, airbags and fenders are replaced and then the vehicles are sold. In 99% of the cases, the indications on the mileage-meters of the newer vehicles are being manipulated in the dealerships with the help of computer software, so that the price looks attractive for “unused” car, which is actually almost fully amortized and battered. In Western Europe, including Italy, an annual mileage of 15-20,000 km for a petrol car and 20-25,000 km for a diesel car is something completely normal. A 10 years old petrol car should have at least 150,000 km indicated on the mileage-meter and a diesel one – at least 200,000 kilometers. If you are offered a 10 years old car with less than 100,000 km travelled, you should be cautious, hang а computer device on the vehicle and check the computer’s memory of the car. Almost always this memory has not been reset when the mileage had been manipulated and it shows exactly how many kilometers the car was actually driven. You should ask for the service booklet of the car which should include all performed technical maintenance and repairs. If such a service booklet is represented to you, but the mileage-meter of the car shows less than 10,000 kilometers per year travelled, then you can feel free to continue looking for another vehicle to purchase. The cars driven in Germany are in most of the cases with astonishing technical and visual advantages before those from Italy. The Germans are famous for their love for cars. The Germans are driving on the best highways and roads in Europe and are using high-quality fuel. They also keep their service booklets as well as all invoices and notes for performed services and repairs on the vehicles, if any have been even made. Yes, the cars in Germany are more expensive than the Italian ones, but higher quality has its price. Buying a car from Germany does not significantly differ from buying a car in your own country. The only obstacles are the language barrier and the distance. Today, however, the air transport is widely used and many low cost flights from Sofia to Germany are offered at prices below 100 leva. Moreover, many Germans are speaking very good English, thus, a person should not experience some difficulty by purchasing a car if he is well-prepared and knows what he’s doing. First, I will explain you how to purchase a car from an individual. 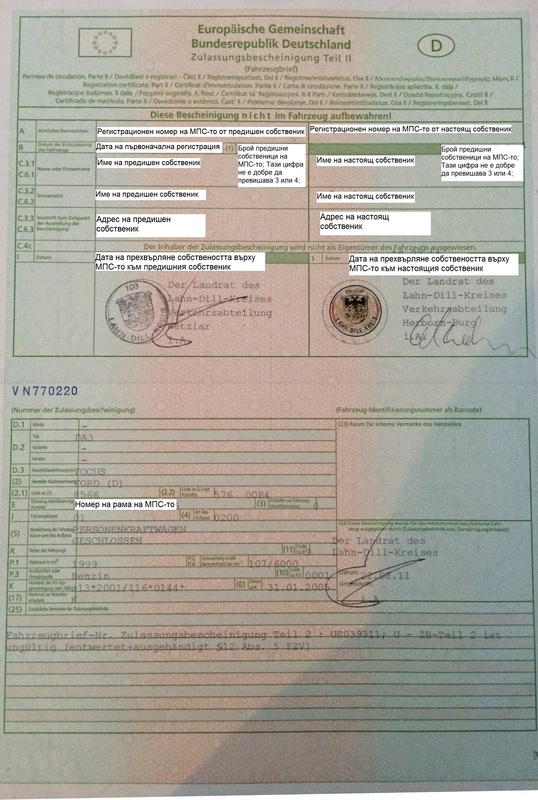 In Germany as well as in your country, each owner of a registered vehicle / car / automobile must possess the so called big registration document (Zulassungsbescheinigung Teil II) and small registration document (Zulassungsbescheinigung Teil I) of the car, a document for technical inspection (TÜV), a document for insurance liability (Haftpflichtversicherung) and a driving license. At the time when the car is offered for sale by the owner (on mobile.de, autoscount24.de, for example), they are two possible options – the car is registered and is in motion, or the car is unregistered (it has its plates removed), therefore, it cannot be driven on the road. Even if the car is registered by the time of the sale announcement, a German would never sell the car with the registration numbers, they will always go to their Registration Office (Zulassungstelle in German) where the car will be unregistered and they are going to sell it to you without plates. The advantage for the car to be registered when announced for sale is that you as a buyer can make a test ride (test drive). Generally, a German car should not be sold unless it has passed TÜV examination. 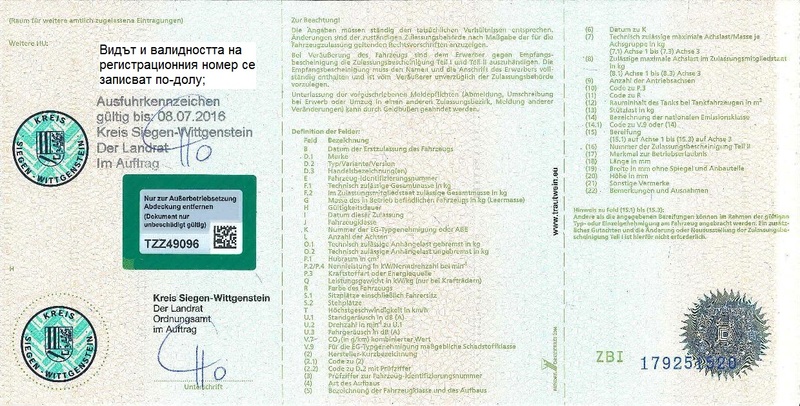 Honest sellers of private vehicles are required to first pass the TÜV examination if it had already expired and then to announce the vehicle for sale. If in the notice for sale there is no explicit mentioning that the car has recently undergone a TÜV examination and successfully passed it, be especially careful. In the sale announcement it should be mentioned that the car’s service booklet is maintained without interruption, and that all invoices and notes from the underlying service and other additional repairs are available and can be presented if this is of interest to the buyer. There should be a picture of the service booklet in the car sale announcement. Check what is the actual mileage of the car and check if everything is recorded without interruption until reaching this mileage. In the technology world we live in, almost all people possess smart phones and use chat applications such as WhatsApp and Viber. In Germany WhatsApp is the most commonly used application for communication over the Internet and mobile phone. Every ad for vehicles should contain a phone number or email contact. You can contact the seller for free directly via WhatsApp or by writing an email. If in the listing nothing is mentioned about the technical condition of the car, about the next check date (TÜV), or the booklet of the car, then these are the first things you should ask your car dealer for. First, consider whether the pictures on the ad are sufficient to determine whether it makes sense to think of buying this vehicle. Very often the sellers do not publish pictures of the engine, trunk, mileage, gear lever, pedals, exhaust pipe or a frontal picture of the car. These are the components through which can be easily recognized whether the car has any visible flaws. If you do not see such images in the advertisement of the car you like, you should ask the seller for them. Request photos with high resolution (at least 6 megapixels) that can be zoomed (zoom in on the photo). Because applications such as Messenger, WhatsApp, Viber compress images sent between users in order to save server space, then ask the seller to send you the pictures with better resolution directly to your email without any compression. If you remain satisfied with the visual condition and the photos do not awake any doubt in you, move on. In Germany it is common for sellers to publish in the listing what parts have been recently replaced in the car, what parts have to be repaired, what is not functioning (such as navigation, radio, armrest, for example) and what should be done in the car. The Germans also take photographs at close range if the car has any external faults (they call them optical). If such explanations are lacking at the car advertisement and the vehicle is more than 5 years old, be especially careful. Perfect cars are not encountered often, even in Germany. 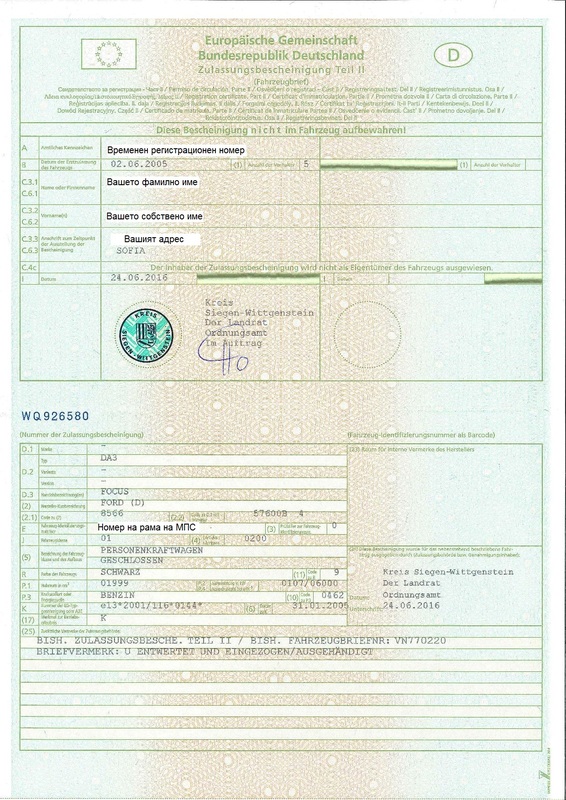 Pictures of the large and small registration documents of the car to check how the owners’ history changed before the current owner – If the seller does not want to share personal information (name and address) ask them to hide this information by using a simple program like “Paint”, which is incorporated into every Windows and is available on any computer. A photo of the last passed TÜV examination on which is visible on what date the examination was passed, that there are no defects which has to be repaired and when is the next date for the car check. 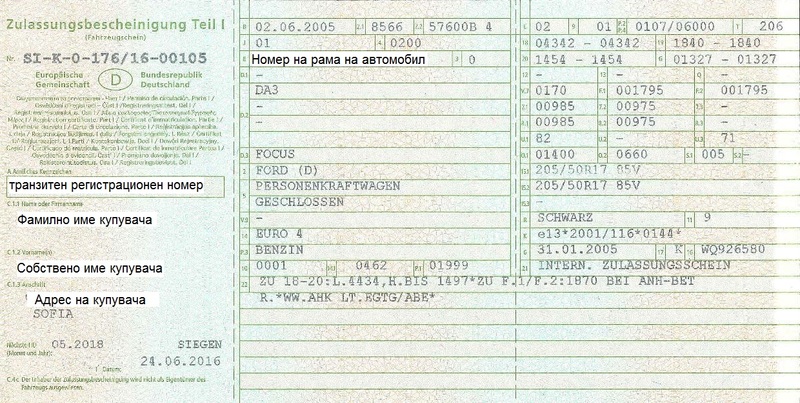 A copy of invoices from visiting the service for performing technical maintenance of the car which should be clearly legible – date, mileage-meter of the vehicle, replaced parts and their cost. If the seller refuses to send you some of the requested pictures without reasonable explanation or he tells you canard, do not bother yourself more with this vehicle and this seller. Obviously, he is hiding something and it’s better to give up on this purchase. If the seller is cooperative and can provide all the requested pictures of documents and photos of the car, then you should download the service booklet for this specific model and brand of car and check whether all maintenance activities for the vehicle are carried out on time and what remains to be performed. Very often people sell their car before the time comes to visit a service in order to replace expensive parts (because the parts are obsolete or because of producer’s prescription for replacement after a certain number of kilometers). If you find out such a case (for example, a change of candles due to traveled 60,000 kilometers after the transitional change for gasoline engines), but if you like the car and you tend to perform technical preventive maintenance after the purchase, the knowledge of this fact can be used throughout negotiations on the price and you can get a price deduction. Ask the seller to make a video clip as before starting the engine, the front bonnet of the car should be open. The seller should start shooting the video with his phone by, first, starting the engine while filming the dashboard of the car and keeping the camera on it for 5-10 seconds, then he should come to the front of the car and film the engine while it is running. You should request from him to find a quiet place with no disturbing noises. If you do not hear howling, clattering (diesel), a whoosh or other unusual sounds when the engine is turned on, you can continue negotiations for the purchase of this car. If the seller refuses to make a video clip and send it to you via WhatsApp, Messenger, Viber or email (it takes up to 5 minutes with any smartphone), then do not waste more time and search for another vehicle. If you are satisfied with the condition of the car, then ask for a little time to consider the purchase. Review again all the steps described above and make a decision. If you can deduce from the price and want to purchase the vehicle, then call the seller (ask him in advance for a suitable time and whether he speaks English if you do not speak German). If you can negotiate the price of the car, you’re at the final step of the purchase. To avoid the translation of the contract, it is good be prepare 2 equal copies – one in Bulgarian and one in German. If you and the seller have electronic signatures, you both should sign the contract and forward it by email. If one of you does not have an electronic signature, they should print and sign the contract, scan it and send it to the other person. Then the second person should sign and scan it and send it back to the first. The scanned copies should be in color so that the signatures stand out clearly. The original contract should be printed on paper, signed once again and received by each party at the meeting. Agree to pay a deposit for the car and pay the remaining amount of money at the meeting with the seller (by hand or via bank transfer). This should be specified in the contract. Make an appointment for the meeting in Germany when it is suitable for you to take the car. Note that the German authorities of traffic police (Zulassungstelle) work maximum until 15 o’clock and you should previously have become familiar with the working time, as well as public holidays in Germany while planning your trip there. If you have proper travel documents, you will need a maximum of one hour by the German traffic authorities. You will necessarily have to go there for issuing of transit plates and documents. Kurzzeitkennzeichen – These are temporary plates to drive the car inside Germany or the European Union. They are the called “yellow numbers” or temporary plates. They are painted in yellow on the right edge, where the day, the month and year of their validity are written. On the sign below, the numbers in the yellow rectangle mean that the number is valid until August 24, 2007. The insurance must be activated online before the car is temporarily registered. This can be done for free on the website from which you purchased it. The deadline for activation is 14 days after purchase. The 5-day validity period starts from the day of registration by the respective traffic authorities in Germany. Belgium, Cyprus, Germany, Denmark, Spain, Estonia, France, Finland, Great Britain, Greece, Hungary, Italy, Ireland, Iceland, Luxembourg, Lithuania, Latvia, Malta, Norway, Netherlands, Austria, Portugal, Poland, Sweden, Slovakia, Slovenia, Switzerland, Albania, Andorra, Bulgaria, Bosnia and Herzegovina, Belarus, Moldova, Macedonia, Serbia, Ukraine. *After receiving the insurance policy, make sure that all countries in which you intend to travel are listed on the back of the Green Card insurance. Ausfuhrkennzeichen (transit) number -This temporary numbers are issued for moving the car outside the country from which it was purchased, or on the territory of the same country if it is not registered (if the country has no other type of temporary plates such as yellow plates for Germany). These numbers are valid in and outside the EU. They are also called red numbers or temporary plates. They have red paint at the right end, where the day, the month and year when their validity expires, are listed. On the plate below the numbers in the red rectangle means that the number is valid until July 8, 2016. Please note that the vehicle must have TÜV, possibly AU. For exact information, contact the road traffic office or admissions office. Albania, Andorra, Belgium, Bosnia and Herzegovina, Bulgaria, Denmark, Germany, Estonia, Finland, France, Greece, Great Britain, Iran, Ireland, Iceland, Israel, Italy, Latvia, Lithuania, Luxembourg, Malta, FYROM, Moldova, Netherlands, Norway, Austria, Poland, Portugal, Romania, Russia, Sweden, Switzerland, Serbia, Slovakia, Slovenia, Spain, Czech Republic, Turkey, Ukraine, Hungary, Belarus, Cyprus. 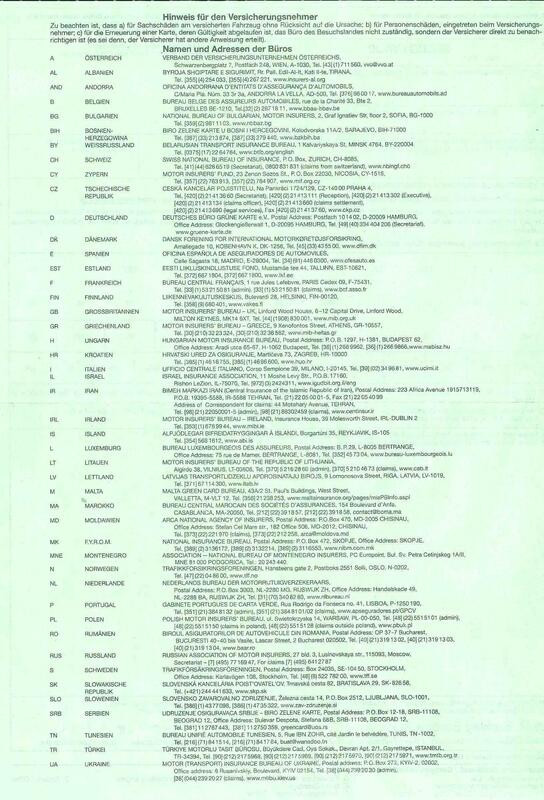 * Please make sure upon receipt of the insurance card that all destination countries are listed on the Green Card. This may vary depending on the insurance company. Valid bank account (IBAN number and three names in Latin). They will be required for payment of motor vehicle tax, which you should pay to the respective municipality for a period of one month (this is the shortest possible period). The rate of motor vehicle tax is determined by various criteria, which you can check here. First select the type of vehicle and year of manufacture. Select – petrol or diesel engine. Select emissions standard which corresponds to your vehicle. Indicate the cubic capacity of the engine in ccm and press “berechnen”. Once you see the calculated number, divide it by 12 and you will figure out the amount you will be charged. If your documents are correct, the traffic authorities officer will take them, will prepare the new documents (registration documents with your names), will assign you a transit plates or yellow plates and will send you to the cashier where you have to pay the required fees depending on what type of number you ordered (yellow or red), what is the type of the vehicle and where the municipality is located, because the fees in the different municipalities in Germany are different. After paying the fees, you have to return to the same officer who will give you a ticket on which the allotted number is inscribed. Having this ticket, you are going out of the traffic authorities and searching for a workshop, where the plates are made. On these workshops is normally “Nummernschilder” or “Autoschilder” written . There are at least 3-4 such workshops next to any traffic authority in Germany and they their working hours concur with the opening hours of the traffic authority. The price of the plates is quite modest – between 12 and 15 euros and they are made for a maximum of 10 minutes. There is no need to be ordered in advance online. They can be taken right on the spot. Once you have the plates from the workshop, you go back to the officer and he should give you the small registration document Zulassungsbescheinigung Teil I and the insurance. 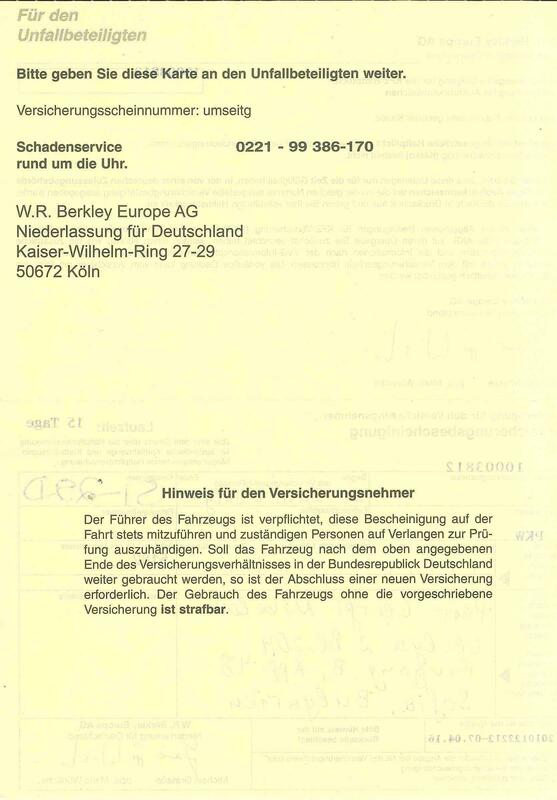 With these documents you are going to pick up your car from the former owner (German). 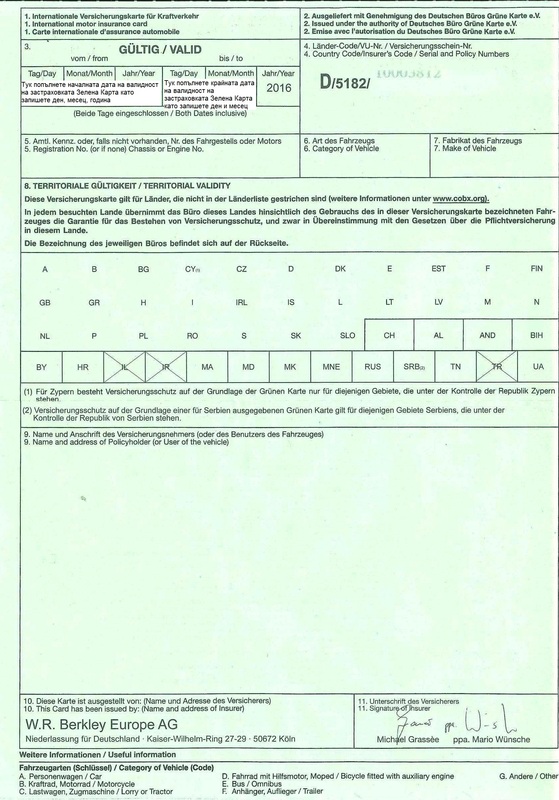 As a general rule, if the owner of the car has passed TÜV less than one month ago, then you do not have to present the vehicle to the traffic authorities in Germany for inspection, but by export of vehicles from Germany this provision is not respected and most likely you will need to present the vehicle to the traffic authorities. A traffic authorities officer will check whether the chassis number of the car corresponds to the numbers written in the big and small registration documents. If they match, the employee will hand you the big registration document Zulassungsbescheinigung Teil II of the car and you are ready to drive off. 1) Make sure that you have fastened the numbers very stable at the front and back. If necessary, you can fasten them with bolts to make sure you will not lose them somewhere along the way and have a problem with crossing the borders. Before leaving for Germany ask the seller which of the aforementioned items are available in the car. In Germany, most of the drivers have a triangle, a first aid kit and a vest. Fire extinguisher, tow rope and a set of spare bulbs are not obligatory in Germany and, therefore, not present in the vehicles in Germany. Ask the seller to check the expiry date of the first-aid kit. If it has expired, it has to be replaced with a new one. A genuine German will buy a new one for you. If he refuses, then you should buy a new one by yourself. * Due to twice higher prices in Germany of these required items, it is advisable, if there are not available in vehicles, to buy them in advance from Bulgaria – triangle, first aid kit, reflective vest, set of spare bulbs. You can put them in your hand luggage when traveling by plane. Do not take with you a tow rope and a fire extinguisher if you travel by plane. The authorities will not allow you to go with them through security checks at the airport. If you travel by car, you can take with you all of the above. – Charge your bank accounts to which you have issued debit or credit cards to prepare for unexpected situations; it’s nice to have at least two bank cards at hand in case that one of them fail due to various reasons, such as exceeding the limit, denial of POS terminal of merchant, exceeded number of transactions, etc; Pre-check with your bank your card limits – 1 transaction for payment, withdrawing, for one week, etc. – Get the navigation maps for the route that you plan to follow and test whether they work! 7) The price you paid to an intermediary for the help with translation, transport and others. 8) Additional costs related to the servicing of the car and its maintenance service, as well as defects rectification if any. Indicative table of expenditures for buying a car from Germany. Total length of the route – 1750 km. Purchase price of the car 5000 9,800 lv. Costs for check in a German service 65 127 lv. Cost for bank transfer 10 20 lv. German insurance for 15 days 57 112 lv. Plane ticket 40 78 lv. 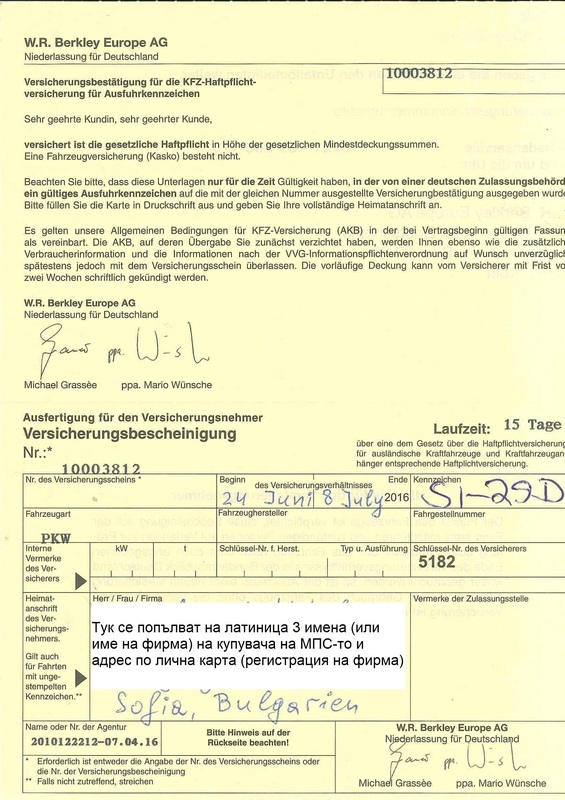 Cost at the German traffic authorities for filing documents 57 112 lv. Travel expenses from the airport to the car (for one person) 30 59 lv. Costs for transit (or yellow) numbers 12 24 lv. Minimum 2 nights along the way an average of 30 Euro 60 118 lv. Fire extinguisher 20 39 lv. Towing rope 10 20 lv. Refueling (1750 km) on average 1.10 euro / liter gasoline and consumption 7l / 100km 135 264 lv. Weekly vignette in Austria 9 17 lv. 10 days vignette in Hungary 19 37 lv. Tolls in Serbia 10 19 lv. Emergency vest 2 4 lv. Bulb H7 5 10 lv. Bulbs W5W 2 3 lv. Bulb H1 4 7 lv. Coupler for the lighter at the car 4 8 lv. Stand for a GSM 8 16 lv. Roof rack for a car (optional) 85 167 lv. 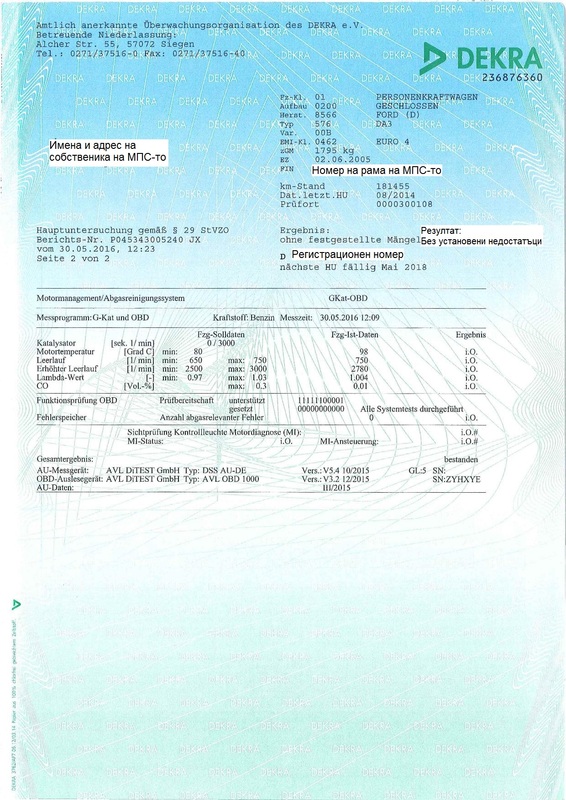 Motor vehicle tax for one year, paid in Sofia 110 216 lv. Civil Insurance Armeec 92 180 lv. Annual Casco Insurance Armeec for the sum of 9800 lv. 250 490 lv. Registration at the Traffic Authorities in Bulgaria 22 43 lv. Annual vignette in Bulgaria 49 97 lv. 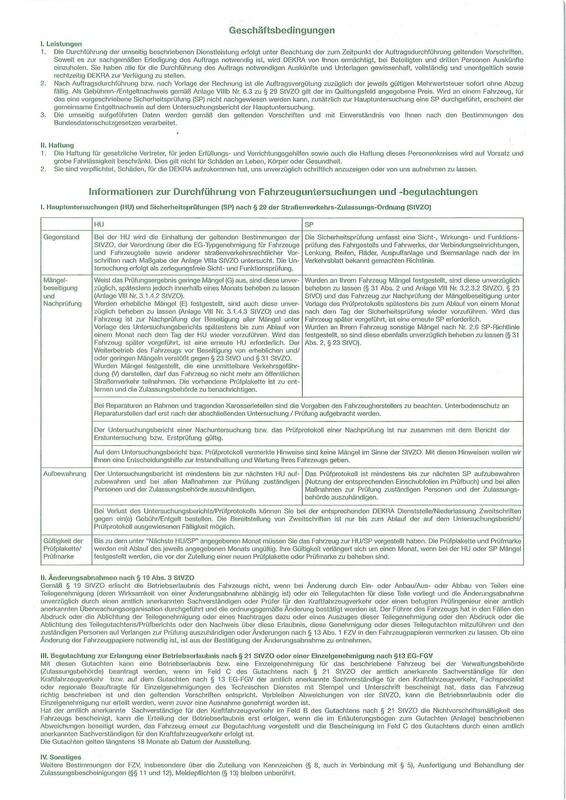 Translation from German in Bulgarian of the sale contract 22 43 lv. Security wheel stud for alloy wheel rims 15 30 lv. Make sure you have calculated all the costs before departure and you can pay them. Before departure carefully plan in which cities you will spend the night and where you are going to refuel. As a rule, prices of accommodation outside the centers of large cities are lower than in the center. Once the car is yours, then I would advise you to search for accommodation on the outskirts of cities, near train stations (S-bahn or U-bahn in Germany) or at best P + R (park and ride), so that you can park your car safely and enjoy the trip without thinking about driving and parking in Western Europe, because it can be quite complicated and stressful at peak hours. At each station along the way you can pay with a debit or credit card, so if you do not intend to stay for a long time, it is not necessary to load a lot of cash in local currency. Your bank card is sufficient. Drive anywhere according to the speed restrictions. There are cameras even where you least expect. hello Georgi. Thank you for the information. I have a situation i wonder if you can help me with. I have friend in France who wants me to to buy a van for her here in germany and drive it to france. I’m registered in germany. is it possible to do that with a vollmacht and just a copy of her passport or do they need the original? and should the export plates and insurance be bought in her name? Yes, the transit plates and the transit registration certificates have to be bought on her name. She can give you a power of attorney (vollmacht) and you can do everything for her. Both of you have to sign a contract for sale. Then you go to the “Zulassungsstelle” and you pay and take the new insurance, the transit plates and the new registration certificates (FZG Brief und Schein). Hi, Agi! Only your id card is important for the registration and for the transit plates. The driving license is taken under consideration only if you get stopped by police on the road. If you have a valid hungarian ID card, go ahead and buy the car. I hope this helps. Very impressed with your site…quick question as I see conflicting information online. If I buy a used car from abroad (i.e. Germany), are there any registration/import taxes? Some sites say I must have owned the car for 6 months or I have to pay a large tax!? Hi, Bob! You have to tell me where you would like to import the car to? When I bought a car in Germany to take out of the EU, I also got export papers (i forgot the technical name) from the customs agents in Germany and then handed them over at the point of departing the EU. I didn’t notice this in your process. As I understood this was necessary to ensure that Europe recognized that this car had indeed been exported, so as not to have problems when return to the EU with other non-EU plates. Is this an unnecessary step? In order to answer your question I have to know which country you are exporting the car to and what is your purpose of export? Are you going to change something on the car and return t it Germany. Why do you want to return the car in the EU. In the process, which I have described on my website, I am talking about EU only. When somebody from EU country buys a car from Germany. In this case there are no customs. If you export outside of EU, then you need customs as well. I want to buy a car from Germany. The seller said we can meet in another city to see the car and that we can get the red plates from any city. What do you think ? can red plates be taken from anywhere or from the city where the car was registered? Hi, Geo! Yes, you can take red plates from any city. There are some exceptions in different provinces of Germany like Baden-Würtenberg. There, the administration officers want the buyer of the car to have somebody living in Germany as a guarantee, that all fines in case any, will be paid by the german resident. Excellent article! CONCRATULATIONS! About my case – and not only my case i think – i need your advice please. I am going to fly a thousand miles away to reach Germany and then trains, taxis e.t.c. in order to reach the final destination, the seller location. And now, the headache starts: What will be happen if the car is not as described? For the seller-dealer nothing will be happen but what about me, waist of money in airplaine tickets, trains, waist of time etc.? So, the question is: how could i know if the vehicle is as described before i reach there? I’ve heard that there are some companies that they can do this job. They visit the vehicle, they do an inspection and they email you the results without you move from your home. The site is: diepruefer.de They charge you approx 150 euro for this. Although this service looks like overpriced, it sounds like a good idea – what is your opinion? I need your advice please, on how you can avoid a bad surprise of a car “not as described” before you make thousands kilometers till you reach there! Hi, George! Thank you for your question. Yes, diepruefer.de is a good option, although they make mistakes as well. When people work, there are always mistakes. The best thing for you is to get to know the car very well in advance by contacting the seller, letting someone check it for you and only then, if it is OK, you go and buy it. I can do this job for you for 150 Euro. I completely take the negotiation with the dealer, organize the technical check and reserve the car for you. Another option I can give you is to use the website – http://www.autobid.de. The cars on this website are fully described with technical and visual condition and you can fully trust this website and the condition of the site. I can import for you every car you like from autobid.de. All you have to do is to go to http://www.autobid.de, then go to “Buy”, then “Dates”, and look at the auctions one by one. Every week there are new cars available. I have a partner in German who plays on the auction and buys the car. Then he invoices the car to you and the car is yours. Let me know what you think please. Please let me know what your thoughts are. Thank you! Found last evening your article about buying a car from DE and it is the most comprehensible guide I’ve read, superb job, thank you for that. Beside congratulating you, I’ve writing to ask your advise for a situation I hope you’re familiar with. I want to buy a car from a german friend. This man is my friend, he visited me in RO, I visited him in DE, so trust it is no problem. The first option is familiar, is what you describe with details on your page, but second option is unclear to me. I am thinking that in RO would be enough if he brings all needed papers and we just make a selling contract here; further, he gets back to DE and unregisters the car and I proceed with procedure to register it here, but I am not sure and couldn’t find anything helpful on internet and among friends. I am trying to find easiest solution from money and time spent points of view. Do you have any advise for me, please, like what is the procedure in BG to buy a foreign car from a foreign citizen ? Hi, Silviu! Thank you for your feedback. Yes, the 2 options you have described are correct. First one – you drive the car from Germany to Romania with the German plates and register the car in Romania. The Romanian authorities will take the german papers and the german plates and you will no longer see them. 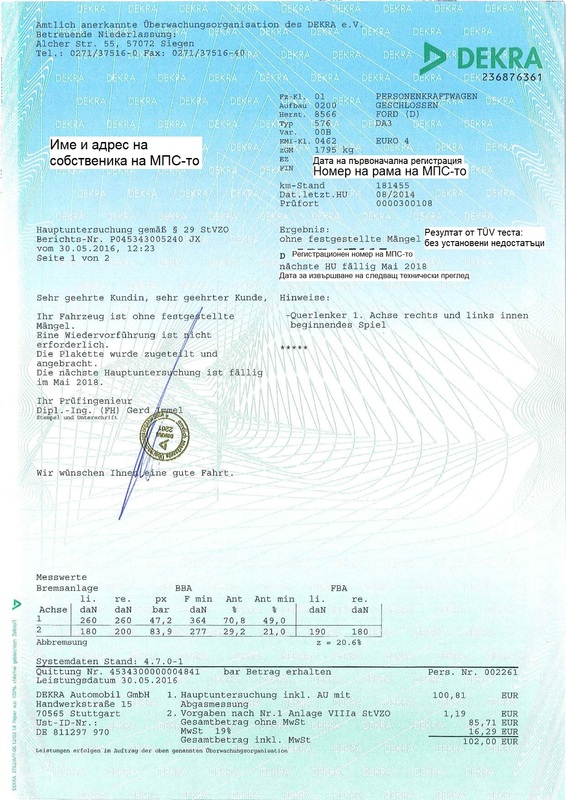 Then you have to take a document from Romanian authorities that the car has been registered there and send this document per post to your friend in German. 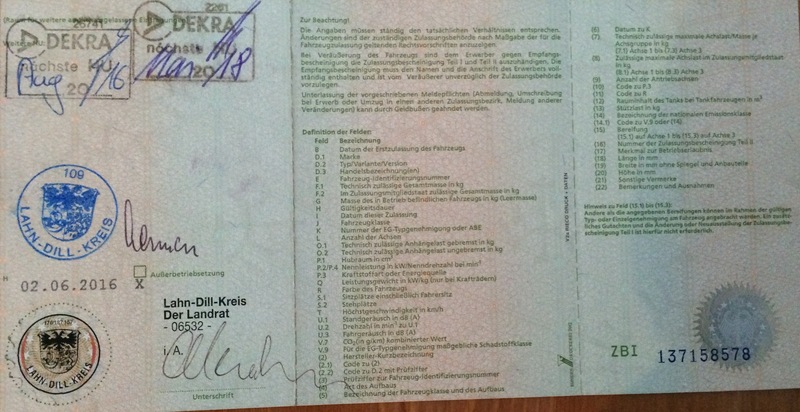 With this document and with the signed contract your friend in Germany can de-register the car there. Second option – your friend de-registers the car in Germany. You go there and take it with transit plates (red plates=Ausfuhrkennzeichen) and drive it to Romania. In Romania you register it on your name. Third option – your friend de-registers the car in German. You send a truck to pick up the car and the truck delivers you the car in front of your home door. I hope that helps. If you have any further questions, please let me know. Your article is very comprehensive. It is realy impressive. However I have a question related to German tax refund. Do you know about tax refund in case export of a car to non-EU country, such as Serbia? Is it possible to claim tax refund in case the seller is natural person-individual? I am not familiar with the law in Serbia, but as far as I know, if the seller is an individual, not a company, there is no VAT. I have a case which might appear slighly complicated, I would like to by a truck with + trailer from Germany for someone who is located in Uzbekistan (he will give me power of attorney). 1. since there will be a separate trailer being bought along with a truck does it need to be somehow notified towards the traffic authorities when registering the transit plates (red)? 2. how about insurance, will it have to be insured separately from the truck? 3. is the trailer a subject for a separate inspection of some kind? 1) Yes, the truck and the trailer are two completely different objects. Both of them need transit plates and insurance. 2) Yes, each vehicle has to have its own insurance. You need one insurance for the truck and another one for the trailer. 3) Yes, the truck has a technical inspection and the trailer shall have a technical inspection as well. All vehicles which travel on the roads of Europe need a valid technical inspection. No, the power of attorney in Germany does not need to be signed by a notary. You will need a photo copy of his ID card as well attached to the power of attorney. Hello Georgi, first of all, congratulations for these explantations. I’m living in France and It turns out that I decided to buy a car from a dealer in Germany (8 months and 9000km) . In France you can get temporary plates valid 4 months , the time to make the paperwork and with the plates a temporary “grey card” which mentions that you can drive anywhere in Europe. That’s a new because a fex months ago you could not go out of France with those plates. Consequently, I told me that it was simple now. I got this temporary grey card from the documents sent by the dealer, I made the plates, got the insurance ……. and I went to Berlin to pick up the car. The dealer gave me the 2 usual 2 documents for the car, plus the COC in order to make the final grey card once in France. Except that once on the way back in Germany, I was stopped by the police saying that I could not drive with temporary french plates. They kept my temporary plates and grey card and I was obliged to leave the car on a parking somewhere in the country, the time to make temporary german plates..
On top of that they put me a fine of 600€. That was last friday evening. So I had to take a taxi and spend my week end in an hotel, the time to reach the local Zulassungstelle on monday. What is your opinion about this ? I know that the change in the procedure allowing to drive in Europe is recent , but they didn’t want to hear my explanations. Hi, Henri! Thank you for your feedback and question. In general the country where you buy the car from is supposed to issue the transit plates. If you buy a car in Germany with German papers, then you have to apply for German transit plates (so called Ausfuhrkennzeichen) and drive the car with it to France. This is my understanding of the things. I am not familiar with the french law, most probably the German police officers as well. As long as you drive the car on the territory of Germany, I think that the German laws apply to you. In this case, the police officers have the right to put you a fine. No, in general it is not possible. If you have original UK papers for the truck, you have to apply for UK transit plates. If you have original German papers, you can apply for transit plates in Germany. Hello Georgi, thanks for these excellent explanations. Of course I will ask for the VAT after I finalize my registration in Tunisia etc.. Does the red plates include an insurance within them ? (at least in EU space) or Do I have to make a temporary insurance on my own ? Hi, Driss! Thank you for your inquiry. Yes, the transit plates are valid with insurance only. You can get 9, 15, 30, 60 days insurance. As long as your insurance is valid, for the same time are your transit plates valid as well. My advice to you is to take 30 days, in order to sleep well and have no timing troubles with your car. 15 days insurance cost 60 Euro and 30 days cost 80 Euro. The difference is 20 Euro only but you get 15 more days. This is my advice to you. In order to claim VAT back you have to register the car in Tunis and send him copies of the registration document, the transport document and one german document in original, called “Gelandebestätigung”. You can download it from the internet, fill it out, stamp it and send it to your seller after your registration is over. So, never send him originals. He needs copies only. Originals stay for you. Claim back the VAT when your car is in Tunis registered. Don’t rush. Leave yourself a 30-60 days time and do everything slow and smoothly. Fantastic article – thank you (wish I had found it earlier)! Unfortunately, the questions and responses so far, do not quite help me in a decision. I am English, but currently a resident in Germany. However, I plan to leave Germany in 2-3 months permanently and register in Spain. The next 3 months will be travel mostly, with no real base as it were. As you can guess, I want to buy a car here to use for travel and then import to Spain. Would you suggest to go for the red plates, at 90 days and then finally import to Spain? I see the cost is €450, so I would rather avoid that! Alternatively, would you advise I register the car in Germany, and then ‘export’ at a convenient time once settled in Spain? Will this mean I must take the car back to Germany, or simply post the plates back? In order to make a comparison, you have to know exactly what kind of a car you will buy in Germany and how much taxes and insurance you will pay for a local registration and the 3-months period of time. On to your second question – you or a representative of you will definitely need to turn back the plates and stamp the small registration certificate (Ausser Betrieb Setzung) before you register it in Spain. You can do this via a courier as well, if you have someone in Germany to do the job for you. The final decision is up to you. Someone told me that if you want to pass Serbia with the export license platew (red) you need to make some papers at the Serbian borders and pay a fee. Do you know anything about it to inform me? Thank you. if you drive a car for your personal use, then you will pass the border with no problems. If you drive a heavy weight truck or light-weight truck, then you have to pay for transit papers. Thank you Georgi for your fast answer. I will drive a passenger car. Do you know if I can do the same with Dutch or Belgian export license plates? Hi Spyros, yes, as long as you drive your own passenger car, you will have no problems. Thank you Georgi for your fast response. Georgi, thanks for this wonderfully detailed information. I want to buy a car in Germany and bring it back to Albania. I saw that Montenegro and Croatia were not listed as countries which recognize temporary german plates. Does this mean I can not even pass through these countries with these plates, in transit? Hi, Eno! You are welcome. Croatia is part of EU. No problem to pass Croatia with red plates. BIH (Bosna) is also part of the countries, taking part in the Green Card Alliance. You can pass BIH as well. Good luck! 1- Thanks a lot for this full of info blog! It’s the Holy Grail for us, east-EU people. 2- You could consider to open a free Revolut(.com) account and accept instant small donations from people who find these informations very usefull. Thank you for your feedback. I think that every EU country can issue red transit plates. You’d better find someone in Croatia to reply this question and do the job for you. Good luck! I’m thinking of getting a car from Germany to another EU country. I’m mainly checking official brands dealerships and not smaller ones, as it’s possible to find good deals there too with a greater amount of confidence in the seller. Do you know if these dealerships ease off the process a little bit? If they take care of getting the export plates themselves, or do I need to be present for that? Your questions are too general and I cannot give you an exact answer. It depends on the dealership/seller. Some dealers need the buyer to be present for the transit plates, some do not. It depends on the Bundesland where the dealership is selling the cars. Some dealers can offer you this service and some can not. Wherever you buy your car, you have to carefully pick up, check and read what you sign. There are a lot of conditions. Hi. In order to process the temporary plates, do I must have a representative who lives in the municipality where I purchase the car? Hi, Andre! It depends on the Bundesland. There are different laws in the different Bundeslands. In Berlin for example – yes, you need. In München for example – No, you don’t need.